Ok class…the letter for today is “G.” “G”…is for Garage Sale. That’s right boys and girls; today we’re going to talk about the wonderful world of garage sales. Maybe wonderful is a bit of an overstatement, but it is definitely a “world” all of its own. Well, perhaps even world is being kind. Planet would be a little more befitting the bizarre intergalactic creatures you can find in the wonderful land of garage sales. Let’s start the education right there. Proper classification of one of America’s greatest institutions is a must. After all, there are many local dialects to which privateer sales of former goods answer. Here are just a few, and my definition of each. The lowest on the rung has to be yard sales. Yard sales appear as though a front door vomited onto the lawn a wave of undigested items in the form of clothes, shoes, crack-framed Picasso prints (wouldn’t he be proud), AS-SEEN-ON-TV museum grade pieces and all manners of other oddities. This is not to say that yard sales don’t yield good stuff…on the contrary. But here is where central Kentucky yard sales can be very deceptive…and dangerous. You see, venture beyond the city walls of good ole Lexington and the majority of Eastern Kentucky looks as though there is a yard sale already in progress; cars, televisions, cans and even an old hound dog or twenty litter lawns giving the deceptive appearance of a bonafied sale underway. But try and join in on the Saturday afternoon fun and you might end up pulling a Bon Jovi. No? As in shot? You know, “Shot thru the heart, and you’re to blame…” Ok, long way to go for a hairband reference, but this blog started later than usual so please extend me a smidge of leniency. Next is my personal favorite, the garage sale. Garage sales are cool because not only can you preview items the seller wants to sell, but you get to take a glimpse into the life of that same seller. It’s like looking directly into the soul of your neighbor. No telling what you may find that others never get to see. Are they closet collectors? Psychopaths? Hoarders? Most of the time they’re just normal folk, but sometimes you find stacks of Playboys next to a bible collection, an unused sewing machine next to tattered clothes, or barely used lawn equipment when the host’s hedges are peering over the windows…even the ones on the top floor! Typically it’s not that dramatic, but as I said, occasionally you get a chance to practice a little armchair psychology. Estate sales are also pretty popular. Estate sales usually look as though the house was all of a sudden abandoned, then a price-gun happy nut came in and peppered the place with price tags. Typically that’s the reality in the case of a death or sudden move or whatever. Estate sales are sometimes done by a company specializing in such sales, but can be performed and orchestrated by normal folk as well. They are neat because you can see a whole house full of stuff still set up inside the home and it helps get a better scale of how something would appear, or even how to set up a room with a particular item. Now, if you ever show up to an “estate” sale and all the stuff is in the yard, correct them (citing your new ed-u-ma-cation) and snobbily inform them “My good fellow, this is about as much an estate sale as Michael Vick is a Zoologist. As Jeffrey Damher is a model citizen. As Hitler was a humanitarian.” Then give them your best Thurston Howell contemptible chuckle and sashay away. Of course, only do this after you have checked their yard for cool items. If you do find something you like, do as we do and simply say “Love your estate sale.” No reason to be snobby to the person with whom you’re about to do business. 1.) The Early Bird. These are the people that get to garage sales, estate sales and yard sales long before they open. Years ago, Jill and I hosted our own garage sale. Jill wisely saturated the market with the standard neon signs at the intersection, arrows pointing to the sale and ads on Craigslist updated every few days to insure a good turn-out. The start time was 9:00 am on a Saturday. I decided to head to Magee’s Bakery at about 8:00 a.m. then meet Jill and her father (who was assisting in manning the sale) with fresh doughnuts and country ham-biscuits. When I arrived at Magee’s a few minutes later, Jill’s number lit up on my cell phone. People were stacking up an hour before we were even set to open! I jetted back with medium warm doughnuts and a coffee stained crotch to find a city of people attending a sale already in progress. The first gentleman inside scoured the merchandise with hawk like precision, grabbed a small ceramic Pomeranian statue for fifty cents, frantically paid, then darted off with an “I’m late, I’m late” vibe reminiscent of Alice in Wonderland. 2.) The Negotiator. William Shatner wouldn’t stand a chance against these old-school, vicious negotiators. I was selling a golf cart one time for a mere $200.00. It ran and was painted to look like an Army truck. Cool and cheap. It was a garage sale, what did he think I would take…goats? “I don’t know, I think two bills is a pretty good deal,” I returned, now scratching my head. He needed it? For what, freelance missions to the Gulf? He was relentless and I would like to say I fought the good fight, but in the end he did work me pretty good. I got rid of the cart and a little pesky pride as well. The negotiators are not to be trifled with. They are pros. They know the cards they hold, AND the cards you hold. They have an uncanny way of getting sale items for next to nothing, and making you think it was YOUR idea. I’m pretty sure most casino owners began as garage sale Negotiators. 3.) The Educator. Antiques are really cool. They have a way of drawing people in for conversation. They remind one person of something they once had, and then the next person of something they never had, but wanted. And as you can tell by most of my meandering blogs, I’m chatty. But sometimes those conversations are very one sided. I compare it to my motorcycle riding days. I researched a bike, I thought about a bike, I looked at bikes and eventually I bought a bike. But no matter where I went, there was always that one guy who wanted to tell ME about MY bike. Collectables are no different. There’s at least a few budding professors that want to tell sellers about their items. I tend to let them ramble; after all I love conversation even if it is on something I already know. Sometimes people just want you to know they are smart. 4.) The Scragglers. I would compare the Scraggler to a vulture, but that wouldn’t be fair. Vultures wait for something to be near its end before they strike. Scragglers are different. They stroll in close to the end of a sale, leisurely look around and nine times out of ten they find some really cool items the early birds missed under the piles of distracting goods. The Scraggler isn’t a Pro, but instead is someone out for a stroll who happens to see a sign for a sale and putters in, just to take a peek. They’re my favorite, mostly because they’re me. They are the ones who don’t have to be there, they just happen to be. They aren’t looking to make a big profit or find that one elusive item they can tell fish stories about the rest of their days. They are just cool shoppers who have strayed from the Big Box grasp and maybe, just maybe, they will find that one sweet thing that keeps them coming back weekend after weekend; that gold coin that entices them to look for treasure. And even though they may never find it, they still have that coin. Yep, Scragglers are my favorite. You know, unless you’re trying to end early to go home. There is also a dark element to garage sales. You have heard the saying “A few bad apples ruin it for the whole bunch.” Well unfortunately garage sales have the potential to have a truckload of bad apples, way above the acceptable bad apple ratio. Some people shove, push and act just plain uncivilized. I spoke with one garage sale lady who recounted the time she had a sale and a, what appeared to be very wealthy lady, swarmed in and scooped up all the costume jewelry she had for sale. She made her way to the register to pay and only then began cycling thru the jewelry. She just wanted to make sure she and she alone got the best stuff. I am told she discarded about 90% of the jewelry. She just didn’t want anyone else to have it. I have heard of people breaking expensive items and never telling the owners. Both owners that relayed this story said they would have gladly forgiven the would-be vandals, accidents do happen, but who just breaks someone else’s things and doesn’t say a word? We as humans are better than that…aren’t we? But the absolute worst has to be a thief. I’m not a religious person, but I do think you go to a special place in Hell if you steal from a garage sale. 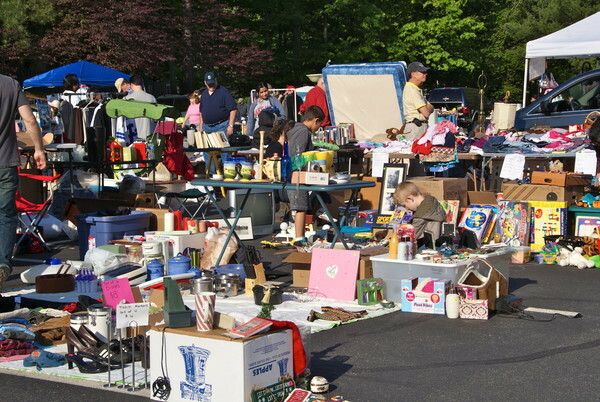 Countless garage sale host and hostesses have recounted stories of theft. And usually it’s nothing grand. A broken sign was one. A pair of $5 shoes was another. We even had a replica Coach bag go missing from our personal garage sale. Mostly all items that, had we been asked, we would have probably given away to someone who needed them or even desperately wanted the item but just didn’t have the money. I remember my mother selling a very nice quilt to a lady once who had a similar quilt when she was a child. The quilt she had burned in a fire and she practically begged my mother to sell it to her for much less than my mother paid for it. And she did. Most people, especially garage sale people are the salt of America. Treat garage sale folk with respect and it will be returned tenfold. There are very few blind trust outposts left in this country. Bizarre things happen at garage sales all the time. I have seen a ten year old boy break dance, several people sang for me. Last weekend I witnessed a nice older lady searching for money she obviously hid in her brassiere until God and everybody could see her full undercarriage. I tried not to look but the tractor beam pulled me in. I got caught. And with a smile she said “Guess I shoulda brung a wallet, huh?” Complete indignation is a trait I look forward to in my twilight. Once I even made money at a garage sale. Jill and I stopped off to check out a sale late in the day. They had a few items of interest, but due to a long day we were not in the mood to neither haggle…nor do much loading. Well, somehow during the conversation (I’m always chatting with people) he said something about model trains. “You have a track?” I asked. “You bet!” He got excited. I had purchased at auction a while back a whole box of timetables, pay scales, forms and all manners of railroadphenalia from as early as 1930 and as late as 1980. He happened to be a member of the Lexington model train club. I ran back to my office and grabbed the books. I got lucky. I not only sold the books, but I sold them to someone who will really appreciate them. And although I had initially wanted much more, fate let me know who the books were supposed to go to. Now, here’s a little insight into the world of auctions I would like to explain. I paid $5.00 for the books. I sold them for $20. That’s a pretty good profit, right. But you have to remember, I bought the books over an hour’s drive away, each direction, drove them back home to Lexington, stored them, attempted to sell them on eBay several times unsuccessfully, and finally months later just so happened to find a fellow who wanted them at his garage sale. Jill and I will go to dozens and dozens of garage sales, yard sales, estate sales and auctions in a month’s time. And we do make profit. Or try to. But just like the example above, although $15 profit is pretty good, there are much easier ways to make fifteen bucks. When we purchase an item, we may have looked at thousands of other items just to get that one that would fit the store. We are quite selective. And we never gouge the customer. If we get a good deal, why, we just pass that along. What I am saying is, don’t listen to Storage Wars or Baggage Wars or whatever glorified “wars” is on the television. Auctioning is hard work, long days and lots of disappointment. But if you do what you love, you will enjoy it that much more. That’s why we continue to look for that elusive deal. We love it: the hunt, the drive and the time we spend together. More often than not we get to see a side of this crazy world that we had forgotten, or perhaps, we just overlooked. Thanks for your interesting post. As the owner of a professional estate sale company, I have met all of the customers types you’ve so nicely described, plus more.